Hot Tub Blower 2HP - Factory Original Air Blower as installed in QCA Spas. Hot tub air blower model 391612OF or 3916120F is a 2 HP, 120 volt spa blower for QCA Spas and other hot tub brands. This 2 HP, super quiet air blower has an intake manifold designed to eliminate small objects and debris from entering the blower. It also has a unique rubber motor mount designed to absorb noise and vibration; it's also the factory original QCA Spa part for your spa. 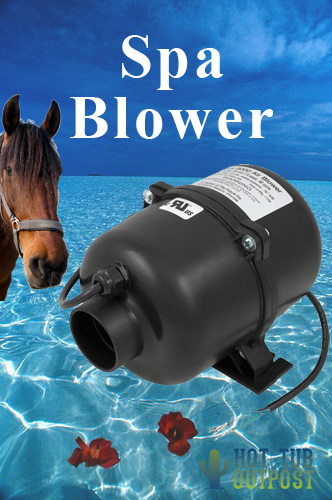 Need tips on replacing your spa blower? See our page about How to Replace a Spa Blower to avoid recurrence of any water intrusion. This blower operates at 110-120 volts and 60hz (North America). Note that even spa systems running on 230 volts have internal transformers to operate 115 volt blowers. Check the label of the existing blower to confirm blower voltage. Note: When removing existing blower, there may be mounting screws or bolts that mount the blower to the floor of the spa. There may also be an additional screw holding the hose or pipe to the blower air port. Be sure to unfasten all bolt stainless steel screws before trying to remove the blower from under the cabinet. Also unplug the blower cord from either the spa pack or the circuit board with the power at the breaker shut off. If the original blower cord is serviceable, it may be reused on the new replacement blower.